STACCO translates to “break away” in Italian and on the race course, STACCO means to push speed to the limit and “detach”, creating a gap between you and your opponent. The STACCO Experience team will help you break away from your everyday and immerse yourself in the world of a professional race car driver. With every curated detail planned to perfection and professional racing resources supporting your every turn, we hope you will join us for this unmatched adventure of speed, adrenaline, beauty and luxury in the heart of Italy. Our incredibly talented Operations and Team Manager is Christian Pescatori. With decades of experience competing at both European and International levels as a driver and team manager, Christian is the perfect person to manage, organize and execute all on-track activity including your racing team, cars and logistics. 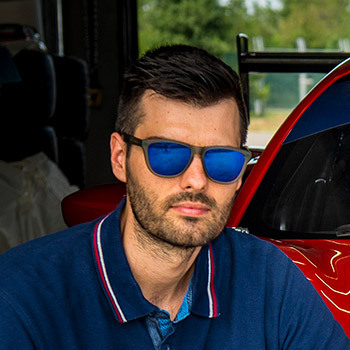 As one of the most respected drivers, team managers and driving coaches in Italy, Christian Pescatori has countless competitions under his belt. Christian has participated seven times in the 24-Hours of Le Mans, earning two Overall 2nd Place finishes with the Offcial Audi LMP1 Team and the FIA GT2 team (of which he was World Champion in 2001). He has also competed in the Le Mans Series, where he won the 2005 European Championship. Christian, who has coached many drivers to professional levels, will be your personal driving coach and racing support during all your on-track experiences. Christian will bring to you the same level of technical and psychological support he provides to professional drivers to maximize their potential in competitions. 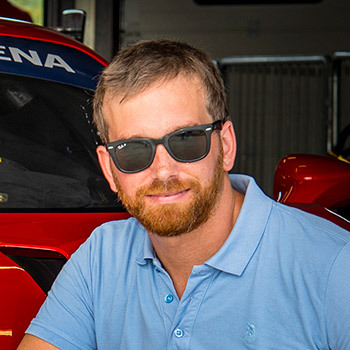 Marco brings his passion for luxury travel and race car driving to the STACCO Experience. After completing a double degree in Hospitality Management and Business Administration in Switzerland, Marco worked in a variety of important tourism roles and with large hotel corporations in Australia, Italy and Spain. connections to curate the finest travel experiences for even the most discerning of guests. From a young age, Marco has always had an intense curiosity and passion for cars and racing. In recent years, Marco has been fortunate to be able to explore racing at a higher level with the help of driving courses and 1:1 track time with professional coaches all over Italy and Canada. The expertise gained and the contacts he made during this time, combined with his hospitality and tourism background, come together to create this incredible once-in-lifetime experience. Andrea is a talented architect with a passion for cars, Italian travel and design. Andrea pairs his experience in managing major architectural projects and leading large teams with managing touristic real estate in the beautiful, historical city of Verona, where he hosts guests from every corner of the globe. 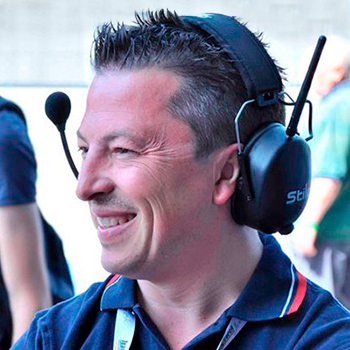 His passion for racing, valuable insights and experience and his network of local and industry contacts, especially in Northern Italy, enable Andrea to deliver high-caliber, expertly-curated vacations like the STACCO Experience for international guests. Every detail – on track and off – has been specially curated to ensure this bucket-list trip surpasses your expectations. From luxury accommodation to VIP transport to delectable meals and wines, we have selected the finest of what Italy has to offer. Pair that with meticulous planning and expert support for adrenaline filled days on two of Italy’s most famous race tracks in a professional Ferrari 488 Challenge championship car, and you just know you’ve made the right choice with the STACCO Experience. From the time you arrive in Milan, every detail of your STACCO Experience will have been meticulously planned out to the highest standards. If you’d like that same level of service in booking your air travel to Italy, just ask our Reservations and Racing Specialists, who would love to use their expertise to arrange your air travel to Milan. Sharing this life-changing experience is priceless. Our Companion Package enables you to share every luxurious element of this five-star Italian vacation with a friend or loved one. Your companion will join you on every step of your racing journey – every one except the driving. They will have their own privileged access to the pits and will watch in wonder from the edge of the track as you test your limits. They will be an integral part of this experience and your biggest fan. Ask our Reservations and Racing Specialists for more details on how to share the luxury and beauty of your Italian driving experience with a companion. From the VIP arrival in Milan to the VIP transfer at the end of our journey together, all arrangements will be taken care of to the highest standard and all expenses included.